Gold and Platinum continue to attain new highs. Gold moved past the $925 mark and now rests at $926.20. Platinum is headed toward $1700, currently at $1695. Silver continues to move solidly, now at $16.55. As strong as the metals appear, many analysts feel there could be a correction, especially for Gold and Platinum. 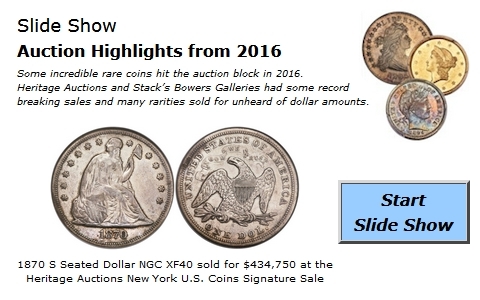 There is less activity to report in this week’s Modern edition of the Dealer Price Guide because there are so many common coins listed. However, the highest grade Registry coins, especially Jefferson Nickels, Roosevelt Dimes, and Washington Quarters remain extremely active as well as the issues related to bullion. There are advances throughout Modern Eagles, Platinum, and Commemoratives. Early Type coins continue to lead the way for strength in the market. Whether they are copper, silver, or gold, there are buyers for accurately graded coins prior to the 1830’s. Many dealers are reporting of expensive rarities changing hands at advances to the listed FMV prices.